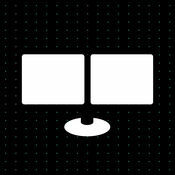 Bloomberg Lens helps you get more from your reading experience by surfacing useful information. Lens looks for the companies and people in an article you’re reading, automatically grabbing the relevant Bloomberg data and gently alerting you if there’s more to see. Lens can work within an app placing relevant Bloomberg data seamlessly in context, without forcing you to switch between apps or tabs. Download Bloomberg Lens to get more from your reading. You can launch Lens using the native share sheet on iOS (enabled by our app) or via a Chrome plugin on your desktop. Reading a single article rarely tells the whole story. As a user, It’s difficult to zoom out and understand the article in its broader context, know what’s changed since it was written, or see how it connects to market events. Lens brings that useful information into focus. Savvy readers often look in more than one place to gain perspective, relying on unbiased data to assess the content they read. 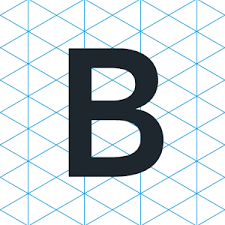 Lens save you time by bringing Bloomberg data and information to the article as you read it. Opening multiple new tabs or toggling between apps while reading in order to fact-check claims, get the latest numbers, dig further on a specific subject, or consult alternative sources is tedious and inefficient. Bloomberg Lens makes your reading experience easier and more rewarding by bringing together the information you need. 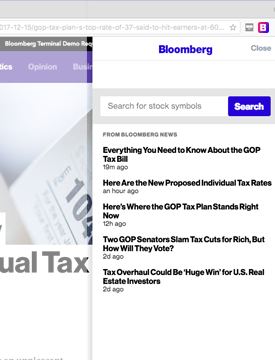 Bloomberg Lens “reads” news stories in real time to detect public companies and then accesses Bloomberg APIs to pull relevant contextual data for the companies mentioned.